Curcumin has long been known to provide potent anti-cancer benefits. Over 2,000 published studies have shown curcumin combats cancers of the breast, prostate, liver, colon, lung, pancreas and more. Many of these studies have shown curcumin actually stops cancer cells from dividing. Curcumin has also been shown to found to suppress genes that promote cell growth and help induce programmed cell death (apoptosis) which is the body’s natural and necessary way of ridding itself from damaged cells. Studies have suggested that high consumption results in lower cancer rates. We already know the anti-inflammatory benefits of curcumin. Combating chronic inflammation, a known contributing factor to the development of cancer, turmeric promotes the body’s ability to fight the spread of cancerous cells. Its potent antioxidants support the body’s natural immunity to oxidative changes—changes that can cause cancer to develop and progress. A 2007 U.S. study using curcumin along with chemotherapy to treat bowel cancer showed that adding curcumin to the diet killed more cancer cells than chemotherapy alone. In another study, curcumin helped stop the spread of breast cancer in laboratory animals. Curcumin in some form is currently being tested in no less than 16 clinical trials on cancer, including prostate, breast, colon and osteosarcoma. Curcumin has one major drawback, it is poorly absorbed from the gut into the blood stream. Our liposomal version of curcumin is very efficiently absorbed, allowing the benefits possible from this herb to be utilized. Please consider including the most highly bioavailable form of curcumin on the market today. Delivered in a liposomal delivery system, our Liposomal Curcumin is 2,000% more effective than ordinary forms of curcumin. It has powerful anti-inflammatory effects and is a very strong antioxidant. Regular curcumin is absorbed at approximately 5-10%, the balance remains in the gastrointestinal tract and is lost. Liposomalized curcumin is absorbed at substaintially higher rate. Please consider including the most highly bioavailable form of curcumin on the market today. 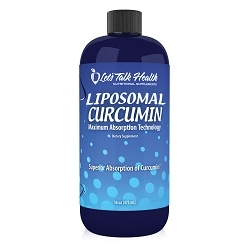 Delivered in a liposomal delivery system, our Liposomal Curcuminis 2,000% more effective than ordinary forms of curcumin.